Adam Christopher is one of the first authors that I met through the Angry Robot Books review program, known as the Angry Robot Army. For the most part he seems to have a penchant for super hero stories whether they have fantastical powers or even if they're just normal people trying to make a difference. His books have been fairly interesting, although I've yet to see a truly break-out novel from him just yet. Hang Wire felt rather different from his other books given it has a stronger fantasy bent more than others. But this is not some medieval adventure or anything of that sort - Christopher appears to be most comfortable writing stories strongly tied to a city, and he certainly does this quite well. And this time around he decided to experiment with the now classic concept of the old gods of myth and legend secretly living among us, as popularized in books like American Gods. And while I've already read a few different takes on the subject, Christopher made sure to bring his own spin to things, which certainly kept things enjoyable. 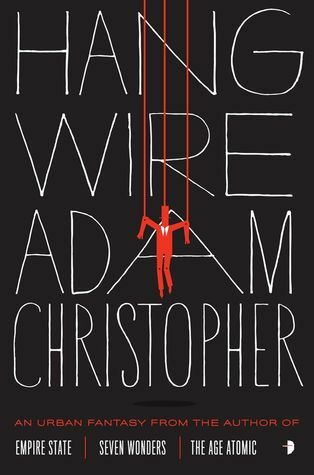 Synopsis: Hang Wire is an urban fantasy novel written by Adam Christopher. As a member of the Angry Robot Army, I received a free copy of this book through NetGalley in exchange for my honest opinion of the work. At the center of our story is Ted, who seems to be experiencing some very strange gaps in his memory. He's also quite notorious for sleepwalking incidents - particularly on the same nights when the infamous Hang Wire Killer commits another murder in San Francisco. And things really come to a head when his birthday party includes an exploding fortune cookie that bears an unusual message - You are the master of every situation. Elsewhere we have a circus in town that is more than it appears. And the circus folk have been unusually violent as of late - as if something was putting them all on edge. We also meet Bob, who appears to be your typical beach bum enjoying life by the ocean. However this is the same Bob who was present in San Francisco all the way back in the early 1900's - and yet he hasn't aged a day. All their stories are fated to intersect in a complex little adventure that involves old gods, split personalities and something beginning to stir beneath the city of San Francisco. The book makes extensive use of time jumps as we trace the history of various characters. I was a little excited when the book first opened with Bob trying to help out during the big San Francisco earthquake so many year ago - and of course showing that the earthquake was actually something else at work. But then we come to Joel, the odd servant of the light and who becomes responsible for creating the strange machines of the circus. His various flashbacks have him jumping all over America and didn't feel like they really contributed to the story significantly. It's not like each component of the circus had a unique story or perhaps individual powers or aspects that we needed to learn about. And you can go through that back and forth between the past and present only so long. When you're well 85% of the book (sorry, I'm obviously a Kindle guy) and you're still going to flashback to yet another incident of Joel meeting someone who has a part of the circus and then killing him or something, that's a bit much. The characters in the present day were already focused on trying put the entire mystery together and yet we keep breaking up the action with the weird flashbacks. The final explanation for Ted's missing time and his ties to the Hang Wire Killer were also a bit of a let down, I have to admit. I figured it would be something like that, but when it did come it, it didn't feel like it was all that legitimate. I don't want to go into spoilers right now, but I just felt the need to go on record to say that I was a little confused by how that was presented. Bob was actually the most interesting character given his internal conflict with his former divine nature. Beyond the smart choice in picking a god that wasn't in any of the major pantheons like the Greek, Norse or Egyptian gods, I like how he was genuinely afraid of losing himself to his powers. Every effort to reach for the divine was a bit of an emotional struggle for him since it meant the risk of giving up his mortal seeming and just abuse his powers as a god. And that was a nice piece of writing right there. The final conflict was okay - the overall resolution of the various mysteries and plots made enough sense and had been decently foreshadowed. And I only cite this since Christopher has demonstrated a bit of a flair for mystery-style stories, something that his fit his other noir-flavored stories like Empire State and such. And he certainly made an effort to recreate that success here. Hang Wire was okay on the whole, but there were bits that didn't quite seem perfectly there. I wonder if Christopher was having a bit of a struggle with wrapping his head around how he wanted to present his godly figures - especially since his pantheon selection seemed rather random. Still, it's a good read and gets a respectable 3 unusual incidents at the circus out of a possible 5.